Mage - There's rarely a problem in the dungeon she can't solve with a spell. Warrior - Her favorite dungeon activity is squashing her opponents immediately. Rogue - Watch in awe as she dispatches monsters with style. Archer - Accurate, brilliant, catastrophically deadly. Paladin - She seeks out danger and shields her allies from deadly enemies. Dragon’s Cave - The thick-skinned wyvern who occupies this dungeon prefers her heroes on the crispy side. Yeti’s Cavern - If you can survive the freezing winds and biting cold, an abominable snowman awaits. Hydra’s Reef - Chop off one head, and another appears! This regenerating venomous monstrosity is a slippery foe. Lich’s Tomb - Hordes of undead foes, evil curses, and magical wards. What could possibly go wrong? Minotaur’s Maze - Abandon all hope, ye who enter here! Forest of Shadows features adventures in all-new lush yet deadly locales. A vast network of mossy underground tunnels and connected forest areas await your heroes! Alchemist - Her mastery of potions and poisons is second to none. Druid - The forest itself bows to her will, guarding her from attacks of beasts and monsters alike. Hunter - Speed is her mantra and the name of her game. Slayer - A lethal blade dancer who twists and weaves through foes with cutthroat instinct. Warden - The self-appointed guardian of all things green. Lair of Indrax - You may have defeated other dragons, but Indrax is another story! The Mudlands - Prepare for a long, grimy journey to face the evil Mud Golem. Realm of Venom - Whatever you do, don't touch anything in here. Smoldering Ruins - The Fire Giant protects his realm with oppressive heat and fire from the sky. The Vile Roots - In this place, the very trees seek to corrupt your soul. Be brave, heroes! Plus an entire 44-card encounter deck that can be played on its own or mixed together with the original encounter deck! 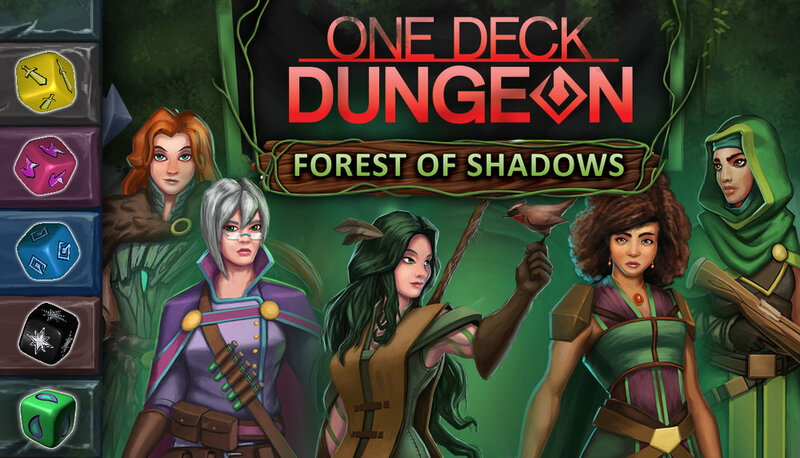 During the Kickstarter, backers unlocked additional heroes and dungeons that are now available in One Deck Dungeon for $1 (USD) each. The first thing you'll notice is the sweltering heat. The further you go into the dungeon, the more your enemies will doggedly pursue you. And to finally reach the Phoenix itself, you must endure its terrifying screech. Only the bravest heroes can handle the heat of the Phoenix's Den! When 6 year old Helena was hit by a city bus in the streets of Lima, she could have died. She was in fact pronounced dead on the operating table, but suddenly sprang back to life exactly three minutes later. She spoke adamantly of visions of heaven and claimed that God had sent her back for a purpose beyond her understanding. Years later, she stumbled upon an ancient cache of Templar arms and armor. With a determination bordering on fanaticism, she trained herself in the use of it. After a year of solitary prayer, It was time for her to fulfill her purpose: to purge the world of evil. In some realities of the Multiverse, Fanatic joined the costumed Sentinels of the world and became a Prime Warden. In this disparate reality, she seeks out and destroys evil within the darkest dungeons! Caliana Asmadi, mascot of Asmadi Games, has decided that dungeoneering looks fun! As a faerie, she’s not so much bound by the normal human hero laws of “health” and “gravity.” If she’d take damage for any reason, she gets bored and leaves the dungeon instead! Healing potions and items that give additional health have no effect on Caliana, but she can use other skills that prevent damage such as Dodge. Two, four, and a six. You'll have to wait to see my tricks. One, three, and a five. Oopsies, look, you're no longer alive. More anarchic than Mages, and more chaotic than Alchemists, Witches hail from the fiery volcanic city of Inanidec. Their strongest magic users earn the full title of Witch only after completing a deadly ritual known as "The Burning". Syvir left Inanidec after completing her ascension and is ready to put her red-hot skills to the test. Her tactical balance makes her a jack of all trades, having studied equally in hand-to-hand combat and high level magic. She seeks power and knowledge from the vaults of The Guild, although her reasoning is unknown. Flagged in The Council's files for a lack of empathy, Syvir does whatever is necessary to win, especially if it means striking an enemy when they're already down. Her teamwork leaves much to be desired; she'll mock her own partners for any show of weakness. 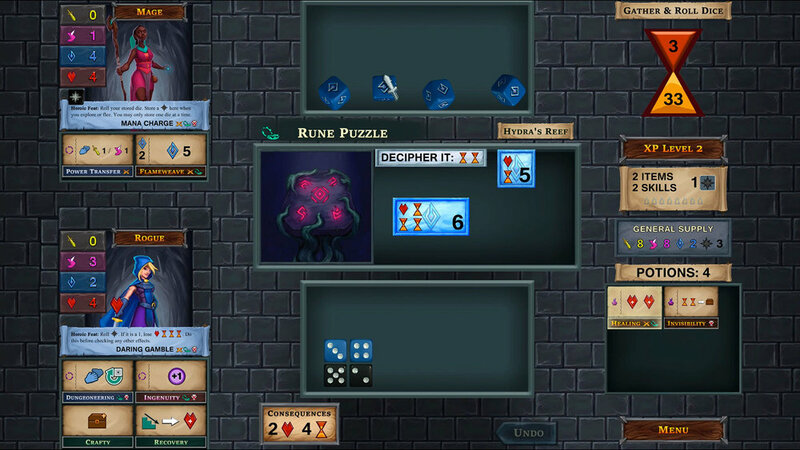 Want to stream One Deck Dungeon on Twitch, YouTube, or elsewhere? Great! We have no restrictions on streaming or monetization. Drop us a line on Twitter, Facebook, Twitch, or YouTube when you're planning to go live and we'll do our best to help spread the word. Planning to play One Deck Dungeon regularly? Get in touch and we may even rehost you from the official Handelabra channels!